A precooked rotisserie chicken, leftover chicken, even canned chicken, if you’re into that sort of thing. Either will give you the head start you need for weeknight dinner prep. Shred your chicken. I recently learned of a really cool hack for this: use a hand mixer! You know, the thing that you mix cake batter with? It shreds cooked chicken like a charm. Preheat the oven to about 400 degrees (F). Heat olive oil in a large saute pan. Add the onions and saute. When the onions are just about done, add the shredded chicken (if it’s too dry looking, add a couple of ounces of the enchilada sauce). 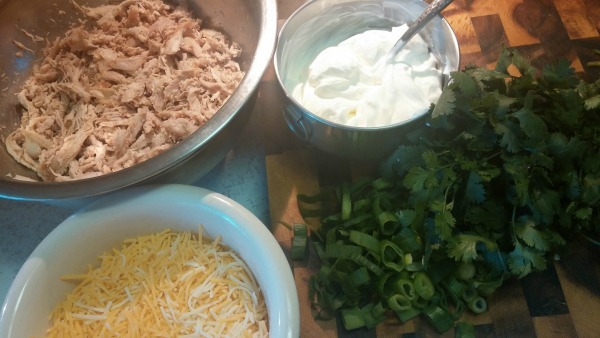 Once the chicken is hot, mix in sour cream. Start with about half a cup and increase gradually, depending on desired creaminess. This is where I add cream cheese, if I have it on hand. It makes the chicken SUPER creamy. Add shredded cheese. Again, start small and increase gradually. The amount is totally subjective here – follow your heart. Once the cheese is melted, remove the pan from the heat. It’s time to stuff those tortillas! Spread a scoop or two of enchilada sauce on the bottom of a glass casserole dish – this will help the tortillas to not stick to the bottom. I like to heat my stack of tortillas in the microwave for 30 seconds so they’re nice and pliable and not sticking together. Take a tortilla and spread just a dab of enchilada sauce down the center. Then add a scoop of chicken filling and roll like a cigar. Place it seam-side down in the casserole dish. Repeat until the dish is full (go ahead and really squish ’em in there). 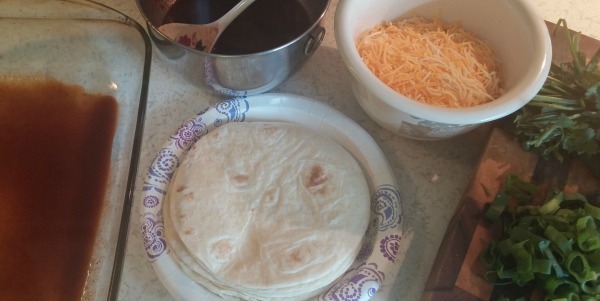 Spoon or pour remaining enchilada sauce over the top of the rolls, then sprinkle remaining shredded cheese over that. Pop it into the oven just until the cheese is melted. Pull it out and sprinkle chopped cilantro and scallions over the top (if desired) and let it cool for 5 minutes before serving. Top with sour cream, squeeze lime wedges over it, or serve with additional cilantro. Heck, top with chopped jalapenos, if that’s your thing. So that’s it. It’s pretty easy, and you probably have the ingredients in your fridge and pantry already. Can’t ask for much more!